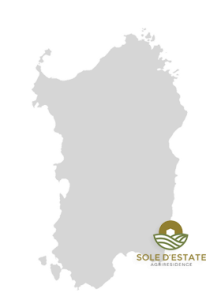 Sole d’Estate Agriresidence is in Sardinia, in the south east, about 55 kilometres far from Cagliari, the chief town. We are in the middle of a farm, only five minutes by car from the beaches of Costa Rei and Capo Ferrato. Inside our farm there is the megalithic complex of Cuili Piras, formed by 53 menhirs. The complex is among the most important in Sardinia, contributing effectively to the reconstruction of the uses of the cultures that inhabited Sardinia in prehistoric times. The peculiarity of Cuili Piras is that the arrangement of the menhirs in alignments and circles is identical to that of other megalithic sites discovered in England, particularly Stonehenge, and dating back to the 3rd millennium BC. : in both cases, these sites have had the function of temples related to ancient astronomical-religious Druidic cults applied also to agriculture. From Cagliari Airport: Follow S.S. 554 in Villasimius / Muravera direction, turn off at Muravera exit and continue on the old S.S. 125 for about 14 km . ; turn left immediately after the overpass and follow Muravera / Nuova VAR S.S. 125. Go on for about 26 km and after several tunnels turn off at Costa Rei / Olia Speciosa exit: then turn left towards Costa Rei and immediately left again towards Capo Ferrato. Follow the S.P. 97 for 2 km. You will find Sole d’Estate Agriresidence on your left. Travel time: about 60 minutes (depending on traffic). From Olbia Airport / Port: take S.S. 125 and drive for about 20 km., Take the S.S. 131 in Nuoro direction. Continue on S.S. 389 and then on the S.S. 390 towards Lanusei, turn towards Cagliari and take the Nuova S.S. 125 in Cagliari / Tertenia direction. Take the Exit at Costa Rei / Olia Speciosa: turn left towards Costa Rei and immediately left to Capo Ferrato. Follow the S.P. 97 for 2 km. and then you will find Sole d’Estate Agriresidence on your left. From Arbatax Port: follow the road to Tortolì and cross the village to get into the Nuova S.S. 125 in Cagliari direction. Follow the Nuova S.S. 125 to Costa Rei / Olia Speciosa exit: turn left towards Costa Rei and turn immediately left again towards Capo Ferrato. Follow the S.P. 97 for 2 km. then you will find Sole d’Estate Agriresidence on your left. From Porto Torres Port: take the S.S. 131 in Cagliari direction. Nearby Cagliari take S.S. 554 in Villasimius / Muravera direction and turn at Muravera to continue on the Vecchia S.S. 125 for about 14 km; turn left immediately after the overpass and follow Muravera / Nuova VAR S.S. 125. Continue for about 26 km and after several tunnels exit at Costa Rei / Olia Speciosa exit: turn left towards Costa Rei and immediately left again towards Capo Ferrato. Follow the S.P. 97 for 2 km. You will find Sole d’Estate Agriresidence on your left. Airline companies: Meridiana Fly, Alitalia, Air-One, EasyJet, RyanAir, GermanWings, SAS, Vueling. Airports: Cagliari Elmas, Olbia Costa Smeralda, Alghero Fertilia, Castiadas Airfield. Navigation Companies: Moby Lines, Tirrenia CIN, Corsica/Sardinia Ferries. From Cagliari port to our Residence. From Elmas airport to our Residence. From Porto Torres to our Residence. From Olbia port to our Residence. From Olbia airport to our Residence.